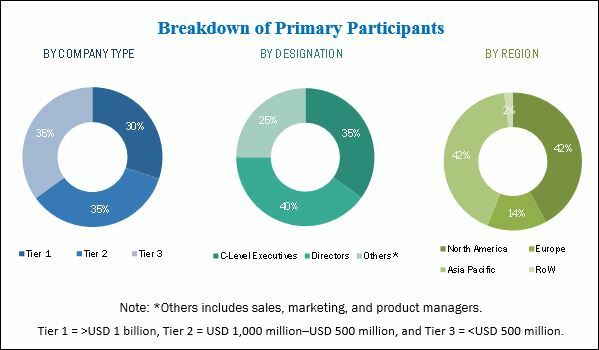 [161 Pages Report] The wearable display market was valued at USD 1.05 Billion in 2017 and is expected to reach USD 3.37 Billion by 2023, at a CAGR of 20.33% during the forecast period. The base year used for this study is 2017 and the forecast period is between 2018 and 2023. The research methodology includes the use of primary and secondary data. Both top-down and bottom-up approaches have been used to estimate and validate the size of the market, as well as the other dependent submarkets. Key players in the market have been identified through secondary research. Secondary sources include references such as annual reports, company press releases, Factiva, and investor presentations of companies; white papers, consumer electronics exhibitions, certified publications (such as IEEE, Science direct, and articles from recognized authors); websites (such as OLED-info, CNET, FlexTech Alliance, Inc., and Touch Taiwan); directories; and databases. All the percentage shares and breakdowns have been determined by using secondary sources and verified through primary sources. All possible parameters that affect the markets covered in this research study have been accounted for, viewed in extensive detail, verified through primary research, and analyzed to get the final quantitative and qualitative data. The breakdown of the profiles of the primaries has been depicted in the figure below. The value chain of the market includes developers of display technologies and associated materials required to manufacture display panels; and panel manufacturers, raw material providers, and brand customers (manufacturing the end products). Some of the major companies operating in the wearable display market are Samsung Electronics (South Korea), LG Display (South Korea), AU Optronics (Taiwan), Japan Display (Japan), Sharp (Japan), BOE Technology (China), Tianma Microelectronics (China), Kopin Corporation (US), Truly Semiconductors (China), eMagin Corporation (US), Hannstar Display (Taiwan), Varitronix International (China), TCL Display Technology (China), Yunnan OLiGHTEK (China), and Lumus Vision (Israel). The report covers the market by display technology, panel type, product type, display size (diagonal), vertical, and geography. Head-mounted displays are likely to hold the largest share of the wearable display market, by product type, throughout the forecast period. Increasing use of AR HMDs or smart glasses in enterprise and industry applications is expected to drive the growth of the market for OLED-based head mounted displays. Moreover, AR can be used to teach complex maintenance procedures for factory equipment overlaying animation-based instructions and reference materials directly onto the physical gear. Many AR HMD or smart glass manufacturers are expected to target the enterprise and industry segment in the coming years. The wearable display market in APAC is expected to grow at the highest rate during the forecast period owing to the presence of major display panel and brand product manufacturers in the region companies usually launch their products or technologies in their respective regions. Early exposure of the latest display products is driving the growth of the market in APAC. 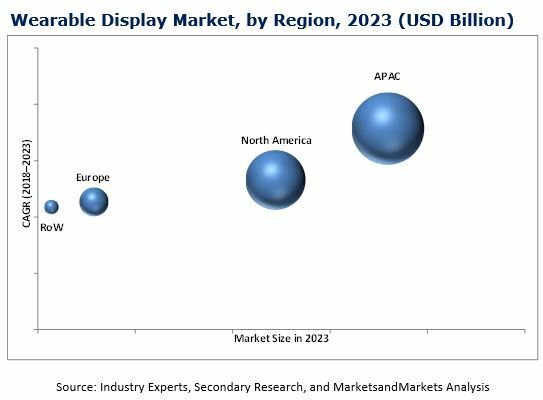 However, the high cost associated with new display technology-based products and high power consumption by wearable devices are restraining the growth of the wearable display market. The fluctuating average selling price of panels poses a major challenge for display panel manufacturers. This report discusses the drivers, restraints, opportunities, and challenges pertaining to the wearable display market; analyzes the current market scenario; and forecasts market size till 2023. Major companies operating in the market are Samsung Electronics (South Korea), LG Display (South Korea), AU Optronics (Taiwan), Japan Display, (Japan), Sharp (Japan), BOE Technology (China), Tianma Microelectronics (China), Kopin Corporation (US), Truly Semiconductors (China), eMagin Corporation (US), Hannstar Display (Taiwan), Varitronix International (China), TCL Display Technology (China), Yunnan OLiGHTEK (China), Lumus Vision (Israel), Dresden Microdisplay (Germany), Jasper Display (Taiwan), Raontech (South Korea), E Ink (Taiwan), and Neovel Technologies (US).